Chicago’s slide began with a 7-3 loss at St. Louis on Oct. 27, and Colliton took over after Joel Quenneville was fired on Nov. 6. The Blackhawks then dropped his first three games behind the bench before shutting down the Blues in the opener of a three-game homestand. 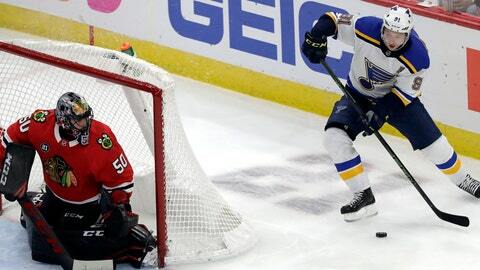 Chicago got the game’s only goal when it caught a break after St. Louis star Vladimir Tarasenko was penalized for hooking in the second period. Jonathan Toews set up Brent Seabrook for an open look that was stopped by Jake Allen, but Blues defenseman Jay Bouwmeester kicked it into the net at 4:05. Allen finished with 18 saves for St. Louis, which has dropped two in a row. WINNIPEG, Manitoba (AP) — Ben Chiarot scored the tiebreaking goal with 7:09 left in the third period to lead Winnipeg. Mark Scheifele had a power-play score for Winnipeg, and Kyle Connor added an empty-netter to seal the victory. Connor Hellebuyck made 27 saves for the Jets, who’ve won three straight in their four-game homestand. Copley was in net for that win and had to quickly get ready for this game because starter Braden Holtby was a late-day scratch with an undisclosed upper-body injury. University of Manitoba women’s goalie coach Gavin McHale, 31, was tapped to be Washington’s emergency backup. DENVER (AP) — Nathan MacKinnon scored the tiebreaking goal with 10:58 remaining, Semyon Varlamov made 20 saves and Colorado rallied past Boston. ANAHEIM, Calif. (AP) — Cody Eakin scored twice, Marc-Andre Fleury stopped 29 shots for his third shutout of the season, and Vegas matched its season-high scoring total. Alex Tuch and Nick Holden each had a goal and an assist, Tomas Hyka also scored and Max Pacioretty added two assists for the Golden Knights. Fleury got his 412th career victory and 51st career shutout, moving into a tie with four others for 24th all-time.